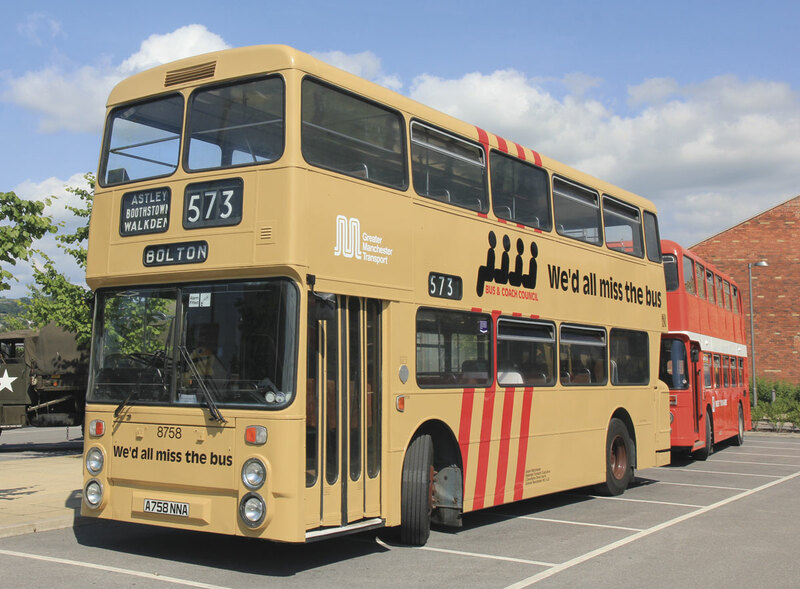 The ‘we’d all miss the bus’ campaign resurfaces nearly fourty years later on a restored GMPTE Leyland Atlantean. 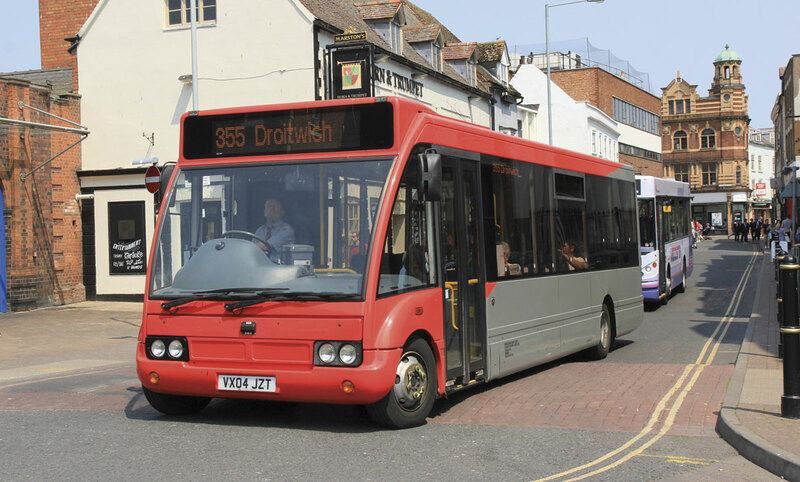 Parts of Worcestershire are potentially in line to miss the bus if supported services are axed. This service which serves developments aside the major trunk routes is being operated by one of the county’s Fleet Services vehicles. Baroness Kramer’s reassuring address at last Thursday night’s CPT Annual Dinner was welcome. She reminded us the UK population continues to grow and public transport has an increasing role in preventing worsening congestion. How true this is, and, as she observed, with buses being the most popular form of public transport by far, the omens are good for the future. She also reminded us there’s an increasing market for young people to travel by bus and what’s more, a third of people now being born will live until they’re 100. First’s updated slogan: ‘better journeys for life’ may be apt after all! Even more encouraging was the Baroness’s commitment ‘we need the industry to thrive to ensure the country’s economy continues to get back on track’ and very importantly she observed ‘now is not the time to shake things up’. It was encouraging and heartening; especially her praise for the dedicated work performed by the industry and her remarks made the subsequent dinner all the more tasty and pleasant! Except when I reflected on what actually is happening ‘on the ground’, I’m picking up vibes of a rather less reassuring state of affairs. I know there’s much to cheer about with investment in new buses continuing apace as well as in new technology such as fuel systems and ticketing. Innovative marketing schemes continue and there are regular success stories of passenger growth on reinvigorated urban and inter-urban routes and networks. But at the same time, dark storm clouds are gathering over large tracts of the country which are on the cusp of possibly seeing buses disappear completely. Far from solving congestion for a growing population, buses could be joining the Arctic Lemming and Blue Stag Beetle into extinction if you live in parts of North Yorkshire, Cumbria, Lancashire, Somerset or Worcestershire. There seems to be a growing disconnect between what politicians are saying, and what’s happening ‘down the food chain’ of reduced public funding at local level. On the one hand the Government mantra of localism keeps being trotted out, yet on the other hand, central Government are effectively demolishing the effectiveness of local government with its continued draconian cuts to public funding. The growing funding gap between Government grants together with their Council Tax raising powers and extensive spending commitments by local authorities is indeed scary and you can’t blame local officers and politicians for fundamentally reviewing what they’re actually in existence to do and cutting back to only fulfilling statutory responsibilities. Indeed this seems to be Eric Pickles’ objective. Some pundits predict local authorities as we know them today will cease to exist by the end of the decade as current structures are financially unsustainable. I remember CPT’s predecessor organisation, the Bus and Coach Council launching a campaign in the mid 1970s, shortly after the new 1974 Act gave powers to County Councils to support bus networks, with the slogan ‘We’d all miss the bus’ to highlight growing concerns that rural bus services were under threat if they weren’t properly supported. Forty years on and after local authorities have used all kinds of innovative ways to fund buses in rural areas together with various grants from central Government such as the recent Rural Bus Grant, the cliff edge seems finally to have arrived and a number of areas are about to drive over it. ‘We’d all miss the bus’ as a slogan has never been more apposite now as bus routes in many rural areas are out for consultation for withdrawal from April. Yet, ministers want buses to meet all the social and economic objectives which get trotted out in Conference and Annual Dinner speeches. Could someone tell Eric Pickles? He really needs to know, as I don’t think he gets it. I commented last autumn on the termination of the Moorsbus network and I now see the similar scheme in the Brecon Beacons National Park, Beaconbus, also faces the axe. Disappearing networks really are becoming reality. This makes no sense at all when we talk about reviving rural areas and helping their economies grow. Localism clearly isn’t working. I was chatting to the CPT’s hugely respected Steven Salmon at last Thursday’s Dinner about this and he made the pertinent observation there are £millions being spent on supporting rural train services as no one would dare suggest such services should be withdrawn. Indeed one of my current retirement recreations is to enjoy the charms of travelling on these branch line delights, some of which only run despite haemorrhaging finance because to withdraw them would be too much hassle and cost in parliamentary processes and reputation. Ironically, North Yorkshire and Cumbria both have examples of such rail lines all heavily funded centrally to meet local needs while the local authorities are both seriously contemplating withdrawing many supported bus routes. I also see Government have allocated £530 million to subsidise the installation of super-fast Broadband to rural areas with the laudable objective of ensuring people living in remote parts of the country don’t lose out on the benefits from such advances in technology. Maybe many of them would prefer not being left isolated by a withdrawn bus? Norman Baker was adept at finding various pots of money in the DfT to launch initiatives such as the positively named Local Sustainable Transport Fund and Better Bus Areas. On the whole, I was supportive of this approach and some useful initiatives have flowed forth. But, when the chips are down, you have to seriously review priorities. Cycle lanes and ‘Personal Transport Planning’ schemes are all ‘nice to haves’ but are not that essential compared to the withdrawal of a bus service. On the same theme, the concessionary bus pass has a lot to answer for especially in rural areas. It really is becoming true to say, there’s no point politicians renewing their commitment to the pass when there’s no bus to use it on. As I’ve pointed out in these articles before; for local authorities there’s a double saving – save paying for the bus to run and save paying the fare of the people travelling on it. And while discussing disconnects, here’s another one. The DfT have launched a consultation on ‘local authority parking’ as a consequence of Eric Pickles’ pronouncements on parking policies and the attractiveness of high streets last year. Unbelievably the Government is inviting views on outlawing the use of CCTV for on-street parking enforcement, introducing ‘grace periods’ before parking tickets can be issued and generally ensuring local authorities have ‘a less heavy handed approach to parking enforcement’. Please take time to respond to it by 14 February. Last year Beverley Bell consulted on introducing draconian new requirements for bus operators to run 100% of journeys within five minutes of timetable while now the DfT intends to make it easier for motorists to abuse parking regulations and thereby add to congestion which will inevitably delay buses. Baroness Kramer talks about the population increases and the consequential growing threat of congestion yet her department says it wants local authorities to slacken off the use of yellow lines and their restrictions. Meanwhile many rural areas are losing their buses. Localism? A new word comes to my mind: ‘disconnectism’.